We had our coed baby shower this past Sunday. It was a blast! For days, meteorologists threatened severe weather on Sunday. Damaging wind, baseball-sized hail and tornadoes were all on the forecast. I became obsessive about checking the weather to get the latest update. In my personal experience, Dallas-area meteorologists tend to be some of the least talented in the nation, and usually get the weather wrong. I chalk this up to them normally being able to say that it's going to be dry, sunny, and triple-digit-hotter-than-blazes out... So when it veers from that norm, they get confused. Well wouldn't you know, they also got this forecast wrong! (Unless you live up in Arkansas... Jeez, sorry guys! I hope you all are safe) It rained for about 30 minutes early in the morning, and quickly cleared out. And heated wayyyyyy up, well into the 90's. Because we're still fairly new to the Dallas area and know mostly couples, we decided to have our shower be coed to be able to see all our friends. 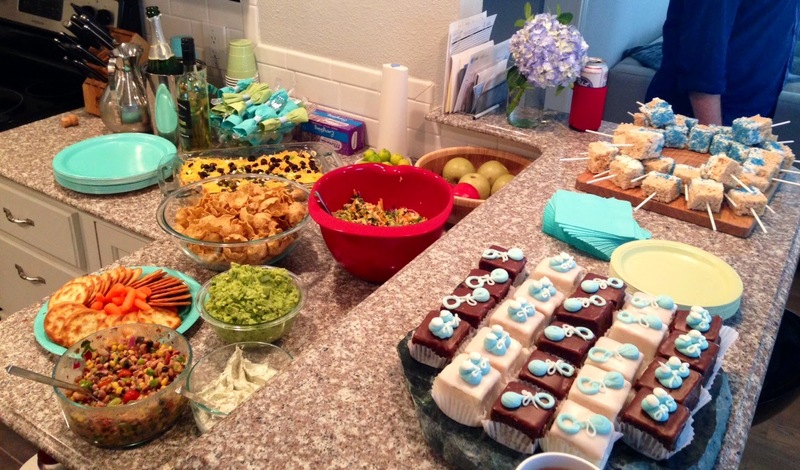 I knew that to entice the men to come out for a "baby shower" I had to include beer. And other non-baby man-things, like grilling and corn hole (that's bag toss to you Northerners). No tacky standard baby shower games, no excessive baby/birthing conversations (unless they were funny stories - then I just made sure the guys involved had a beer in hand! ), and no crafty baby stuff. It worked like a charm! We served grilled cheeseburgers, taco dip, apple/onion guacamole, Texas caviar, jalapeno-white cheddar veggie dip, white chocolate dipped rice crispy treat pops (with blue sprinkles! 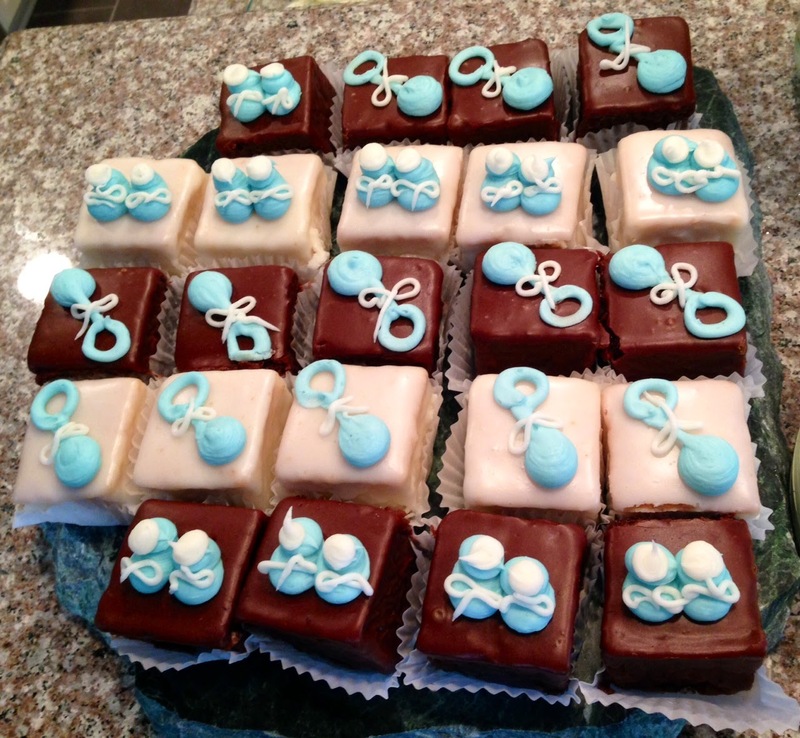 ), baby boy-inspired petit fours; and beer, wine, mimosas, sweet tea. It was fantastic! Two of my favorite Dallas yogis offered to co-hostess the event with me, and I attribute our delicious sides and petit fours to them. Thanks Jenny and Brennan! Some of the delicious food! For decor, I decided to use the nursery theme of neutrals, blues and greens. 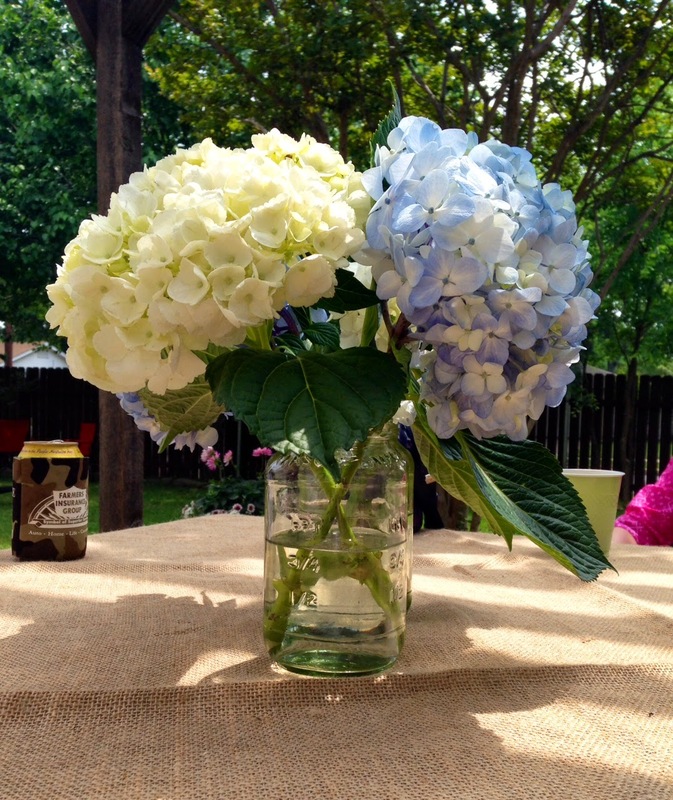 So in addition to the blue and green cups and plates, we had blue and white hydrangeas in green pots or mason jars throughout the house, burlap table clothes, and blue and white pompons hanging from our outdoor pergola. 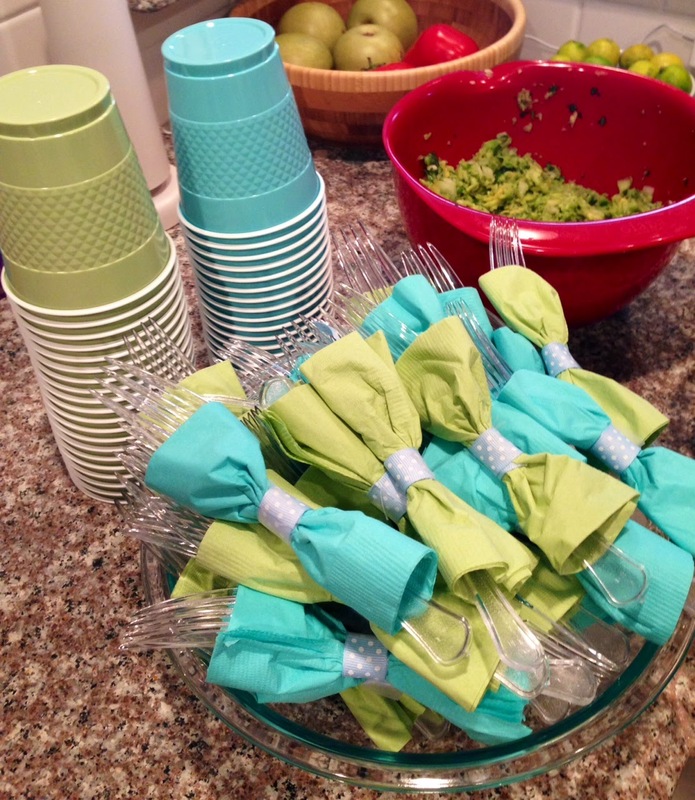 My mother in law and I wrapped napkins around the flatware in the shape of bow ties and secured them with blue and white polka dot ribbons. At the last minute, I decided to put our dogs in blue bow ties, too! They looked good and festive for all our guests. I also bought some fun blue and green "baby boy" confetti to put out, but completely forgot about it. So I'm hoping one of my friends becomes pregnant with a boy soon so we can use it at her shower instead. Take note, friends!! Get to working on it, okay? I'd say everything turned out great! It was one part DIY rustic, two parts Southern preppy, and one part Texan. Sometimes, I think coed events can be... A bit... Strange. Ever been to a coed or combined bachelorette/bachelor party?! Yeah, that doesn't work for me. Things get strange quickly. But since it takes two to make a baby, I really enjoyed having the dudes around for this party. It was a great compliment to the traditional baby shower my bridesmaids threw for me back in January in Minnesota. Thank you to all my friends who have made welcoming this little guy so much fun! Kirk and I are incredibly grateful and we can't wait to share all this love with our son. Coed Baby Shower! That was so beautiful and the different colors are making it more inspiring. Thanks a ton for sharing the photos here. At some local Venues in San Francisco we would also be hosting a shower for a friend and will surely keep these ideas in mind. 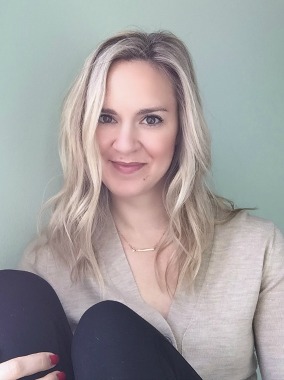 Mommy Monday: Weekend / Yoga / Bed Rest "Style"